Lewis Frumkes, is an educator, humorist, writer and currently the director of Hunter College’s Writing Center which offers up a cultural showcase of writing workshops, special topic courses, and free literary events featuring guest speakers. We had the chance to sit down and discuss the Writing Center and much more. Tell me about the Writing Center. The Hunter College Writing Center which i founded and direct is a central nexus of first-class programming for lovers of culture and learning. Our offerings are free both to the community and to hunter students and faculty. Speaking events consist of best-selling authors such as Alan Furst, Joyce Carol Oates, A.M. Homes, Barbara Goldsmith, Lee Child, etc. And great thinkers such as Freeman Dyson, Howard Gardner, Edward Witten, Steven Pinker, Gloria Steinem and the like. We also offer writing workshops in memoir, fiction, poetry, and non-fiction with professional authors Daphne Merkin, Bruce Jay Friedman, Patricia Marx, Sidney Offit and other talented writers and editors. Each summer we offer a national all day writer’s conference with a dozen panels. This summer keynote speakers will be James McBride and Nicholson Baker of the hunter college Writing Center which has grown and evolved and been supported by remarkably generous friends and benefactors who believe in our mission and help us make it possible. What are the last four books you read? How have you seen the publishing world change over the years? Quite obviously the most important changes have been the changes in publishing from traditional to digital, instant, and self-publishing. They have been revolutionary with broad implications. With the advent of the digital age the publishers have had to adjust and publish e-books, books for kindle and other readers etc. Many publishers have opened digital divisions to address these needs. Amazon and Barnes & Noble have become “the forever library” where books go for eternity, no longer to be shredded or remaindered as in the old days. Self-publishing has changed from “vanity publishing” to a legitimate and respected option for writers. Small presses are proliferating. We are all finding our way in this new world. What authors have you met that most surprised you and why? It is always surprising to find that a particular author has other talents, or an unexpected persona. Margaret Atwood for example is a superb humor writer but when i asked her why she doesn’t do more with that talent she responded that she so enjoys the books she does write and the fans have come to expect certain work from her that she just hasn’t had the time or desire to move into humor. I was surprised as well by the British writer and polymath Clive James, by how well we got along, and the fact that he wanted to air some of my radio interviews in the UK. I have noticed that the suspense writers as a group are not only highly intelligent and interesting, but terrific people to be with. . . Mary and Carol Higgins Clark, Nelson Demille, Lee Child, Steve Berry, Joe Finder, David Baldacci, and Larry Block have all become friends. It might surprise you that Audrey Niffennegger, Tom Wolfe, and Julia Glass are wonderful artists as well as writers. Your radio show “The Lewis Burke Frumkes show” on WPAT-AM in New York is interesting. Who do you have lined up? I generally invite high profile writers whose books I enjoy over and over. Or I try to discover and promote new talents such as Karen Thomson Walker, whose work impresses me. Not long ago I interviewed James McBride, David Levitt, and Nicholson Baker. My interview with McBride happened before he became a finalist for this year’s national book award. I’m not sure if these shows have aired yet. But I find I have a knack for anticipating authors who are on their way to greatness. Colum McCann for example used to teach for me at Marymount and was extremely talented. Now, after having won the national book award, he is widely sought out as a speaker and each of his new books is taken very seriously. He is a professor at Hunter College and works with Peter Carey in the graduate creative writing program, one of the best anywhere. Do you think poetry is as important as novels and short stories? Depends on what you mean by important? Many, many people love and enjoy poetry, but poetry does not sell as well as novels or even short stories. I don’t know a single multi-millionaire who has made his fortune from poems. But poetry is a special and rarefied area of the literary arts and is held in high esteem by the literary community. If you don’t appreciate poetry you should attend a talk or class given by Edward Hirsch, probably the finest lecturer on poetry I have ever heard. You will emerge from his talk seeing poetry in a whole new light, loving it. They say everyone has at least one book in them. Tell me your thoughts on memoir writing. Memoir writing is a hot area and deservedly so. A memoir is an author’s association to a theme, usually from his past. As such, there is no right or wrong. If you remember that you valiantly defended your buddies during the war like a hero that is what you write. It is similar in that way to impressionistic art. Nor is it necessarily chronological as with an autobiography. Many ordinary people for example have done interesting or secret things in their lives that they would like to share before they die. Some years ago an 85 year old woman, Yvette Eastman wrote a memoir entitled Dearest Wilding, in which she reported her love affair with the great American writer Theodore Dreiser, which began when she was 15 years old and Dreiser was 56. She believed it was important to tell their story because Dreiser was an important figure in American history. Yvette stayed with Dreiser until he died and then married his best friend Max Eastman, another important intellectual and literary figure of the time who was 35 years her senior. The Eastman’s became very close friends with Charlie Chaplin and Oona O’Neill. What advice would you give to young writers starting out? For more information on Lewis Frumkes, please visit http://lewisfrumkes.com/. 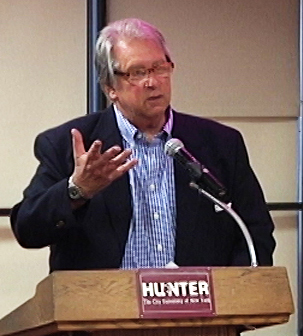 For more information on the Hunter College Writing Center, please visit http://rwc.hunter.cuny.edu.